In Paul’s letter to the Colossians, the reader is introduced to a supreme Christ who created earth and vanquished the power of death. However, this same Christ chose to bear the shame of death on a Roman cross in order to bring restoration and reconciliation to humans and all of creation affected by the chaos caused by sin. The enduring message of Colossians is uniquely challenging and instructive precisely because it testifies to the church’s cruciform life in obedience to this crucified cosmic Lord, Jesus Christ. 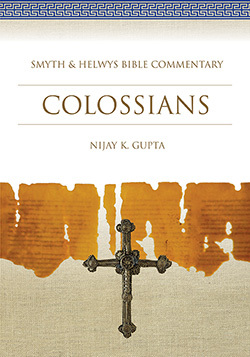 Nijay K. Gupta serves as Assistant Professor of New Testament at Northeastern Seminary (New York). He is the author of Worship That Makes Sense to Paul (Walter de Gruyter, 2010), Prepare, Succeed, Advance: A Guidebook for Getting a PhD in Biblical Studies and Beyond (Wipf & Stock, 2011), and he has published academic articles in periodicals such as The Catholic Biblical Quarterly, Journal for the Study of the New Testament, Horizons in Biblical Theology, Currents in Biblical Research, and Neotestamentica. He serves as co-editor of the Journal for the Study of Paul and His Letters (Eisenbrauns) and blogs on biblical studies at www.nijaygupta.wordpress.com.